Special Guest: My friend Leslie. 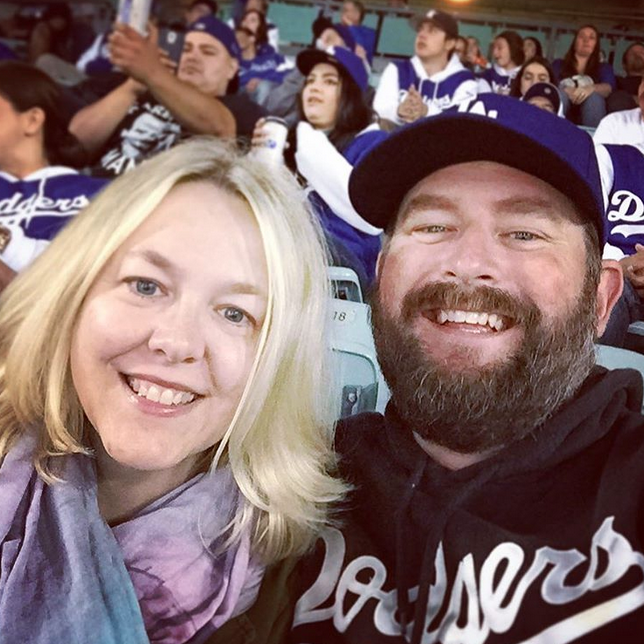 Thanks to her excellent choice in teams (Dodgers, Huskers) she’s like the best sports fan ever. Give her a follow, yo. 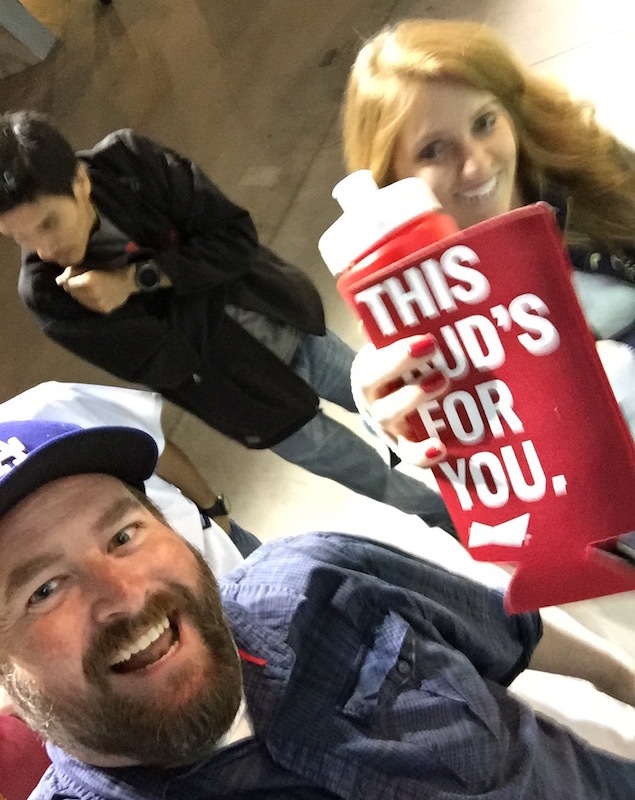 Snacks: Dodger Dog x 2, Stella x 1, Bud Heavy x 1. 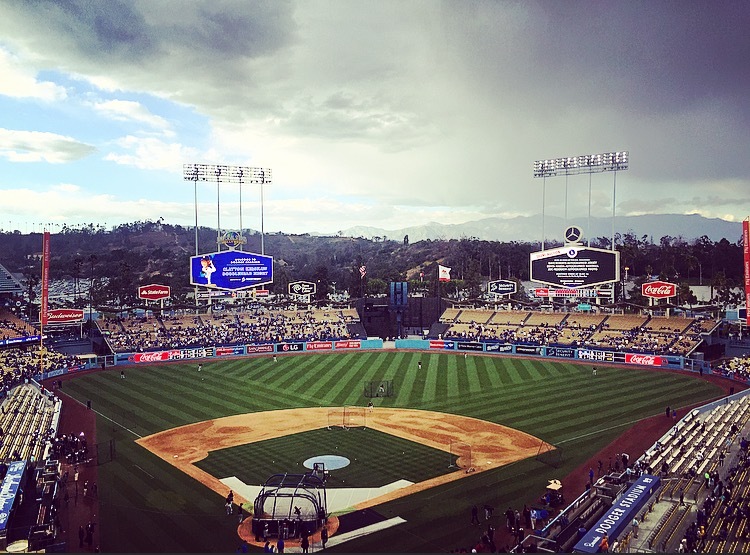 Giveaway: Tonight’s gift was seeing Clayton Kershaw pitch for the first time this season. Memorable Moment: Our ol’ buddy Giancarlo Stanton sending a Kershaw fastball to Glendale will be seared into my brain for a long time. The lack of focus in this photo can be blamed on Dieter, the new organist. 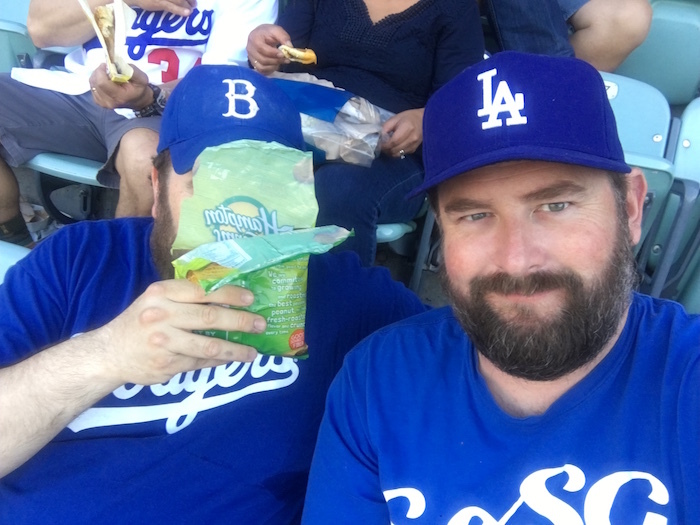 When the Dodgers lose, he likes to play Tomorrow (aka that depressing song from Annie) causing us to bolt out of the stadium as fast as we could. 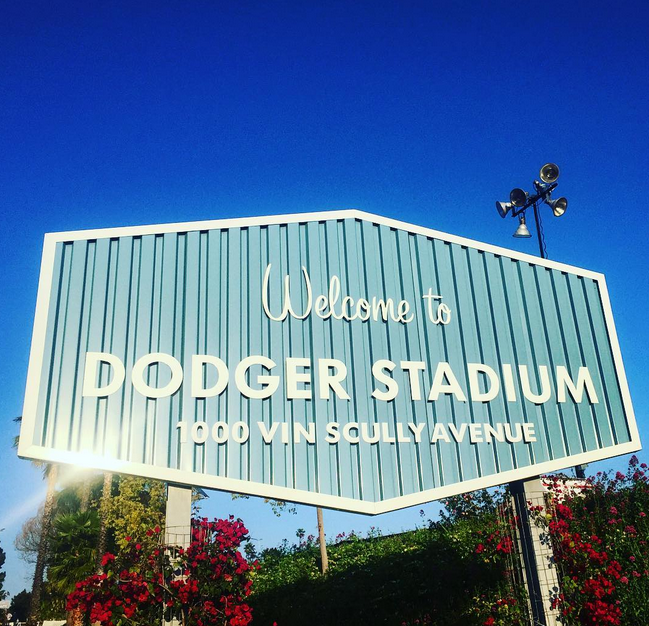 RECAP: With Clayton Kershaw on the mound and Donnie’s Flailing Fish still the opponent, this game couldn’t have been more of a lock for the Dodgers. Unfortunately, as we all know, baseball can be a very cruel game. 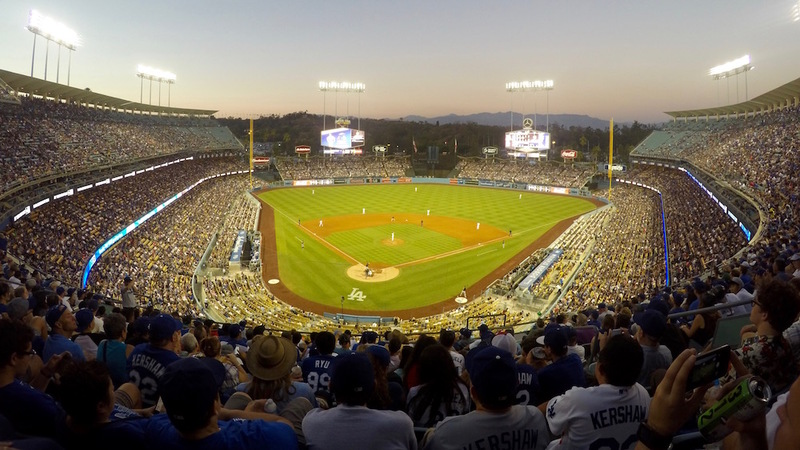 The Dodgers jumped out to a quick 2-0 lead on a pair of run scoring wild pitches. 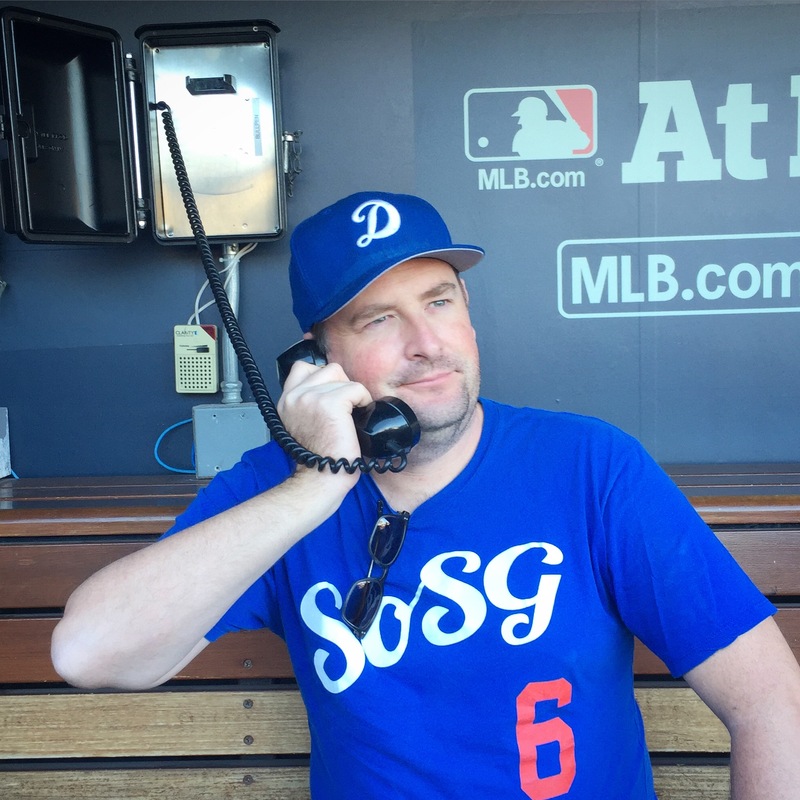 Clayton helped his own cause throughout the night with a fake-bunt-to-slap-single followed by a run scoring double that put the Dodgers up 3-0 heading into the sixth inning. Normally, three runs is plenty of cushion for Kershaw but the Marlins refused to get on the hook. They strung together four consecutive hits (netting only two runs) in the top of the sixth to bring Stanton to the plate with two runners on. 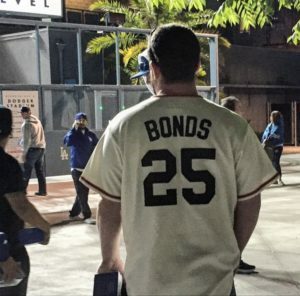 He promptly deposited a fastball into center field to give the Marlins a 5-3 lead that they would not relinquish. 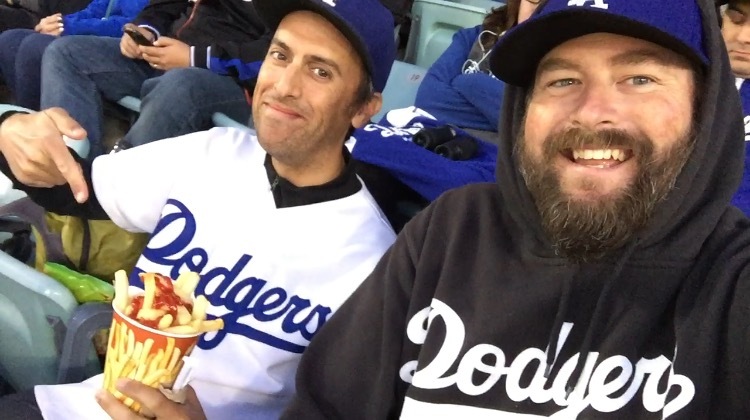 In the bottom of the ninth, the Dodgers gave the fans who stayed until the bitter end a glimmer of hope. 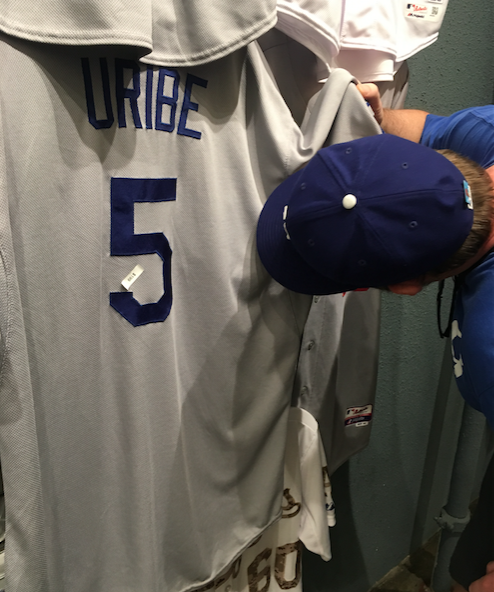 Joc Pederson roped a double and Chase Utley drew a walk, giving Corey Seager a chance to give himself an early birthday present but it was not to be. 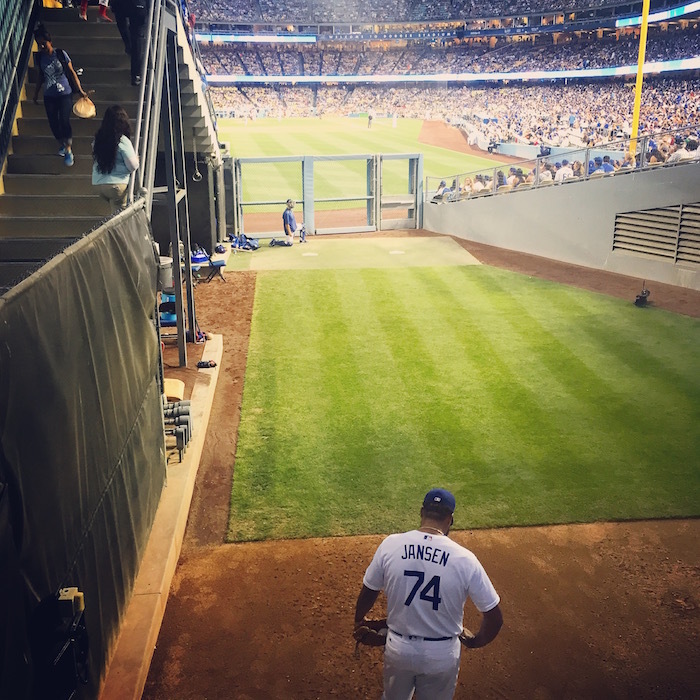 Despite witnessing the Dodgers lose consecutive games, the evening at Dodger Stadium was far from being a total loss thanks to getting to watch Kershaw warm up from the bullpen overlook. 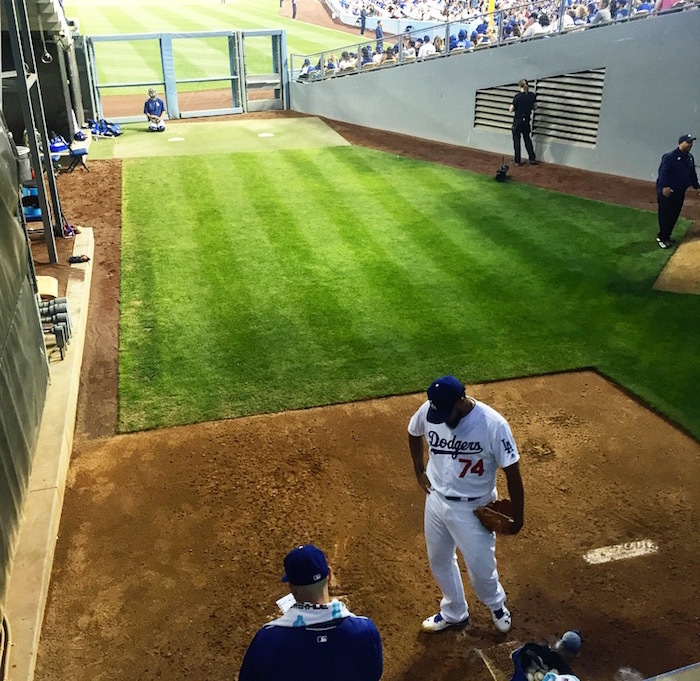 If you ever get a chance, it’s definitely worth it to arrive early enough to claim a seat over the pitcher’s mound. You’re so close to the action that it’s like hanging out the top of the key while Steph Curry practiced his free throws. 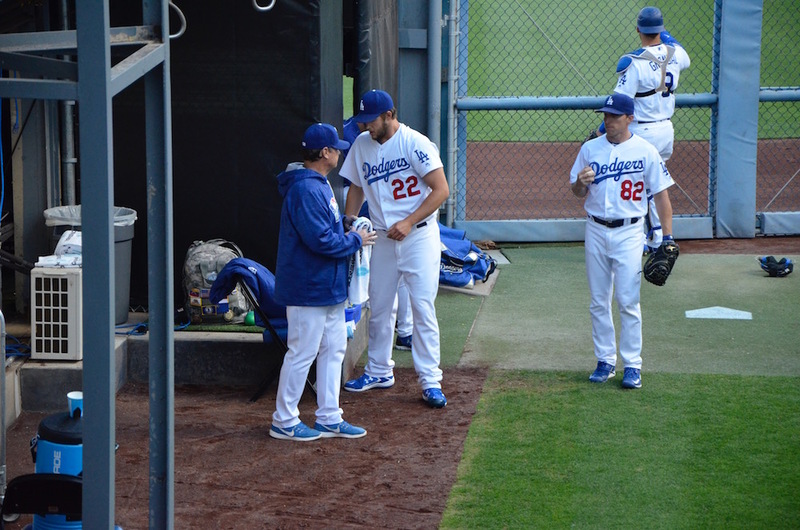 Some photos of the Kershaw warm up experience follow below. 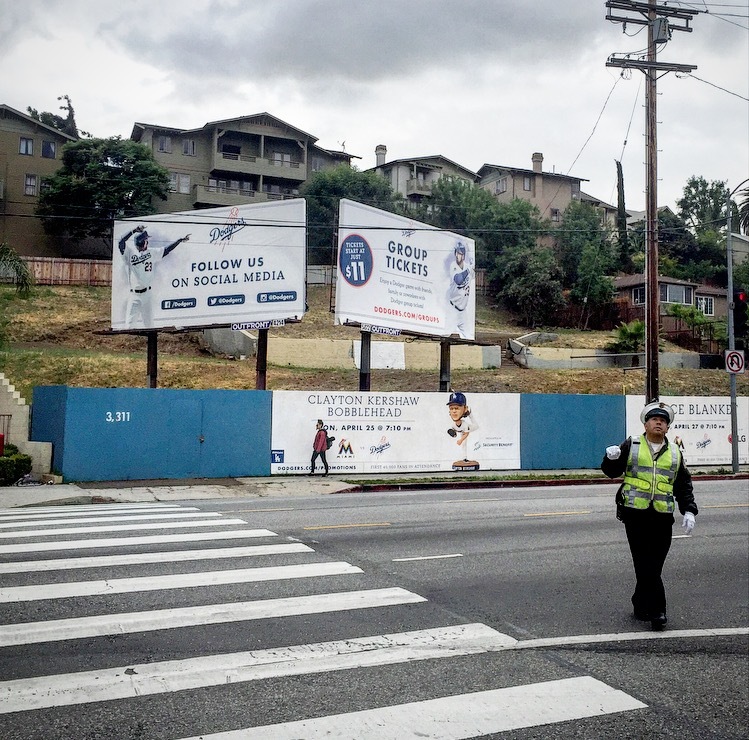 Click to open in a new tab to see them full-size. 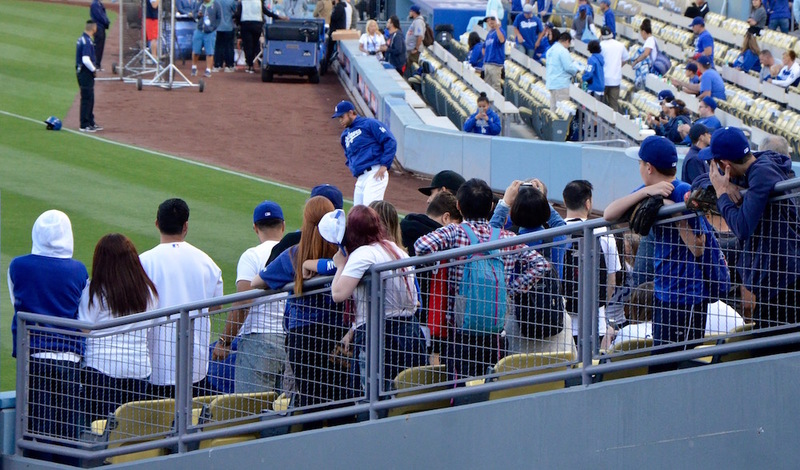 All eyes are on Kershaw as he begins his pre-game ritual. 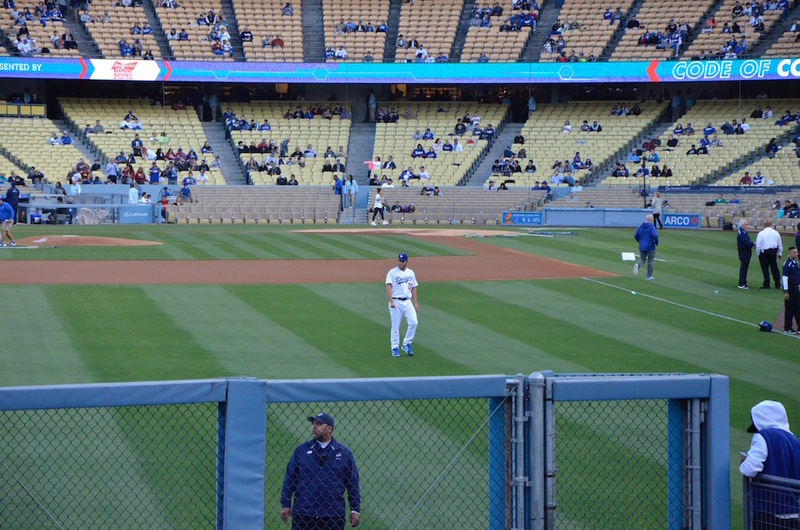 Kershaw goes for a nice, relaxing stroll around the field. 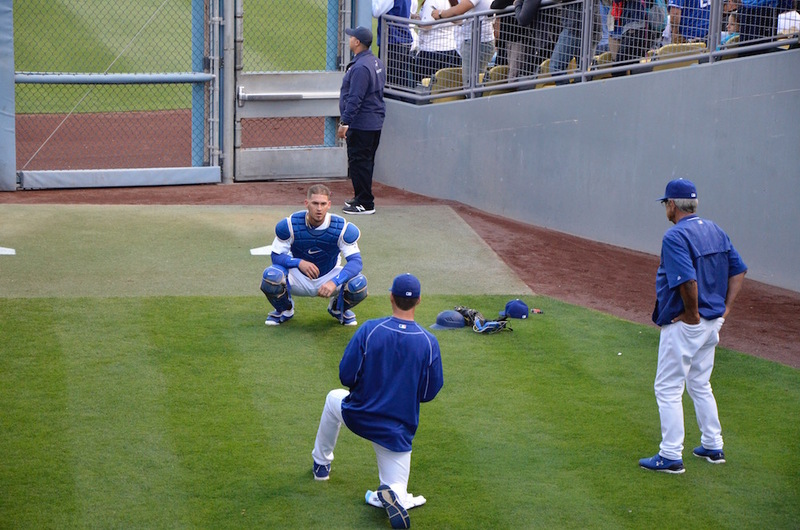 Meanwhile, Yasmani Grandal goes through his own routine. 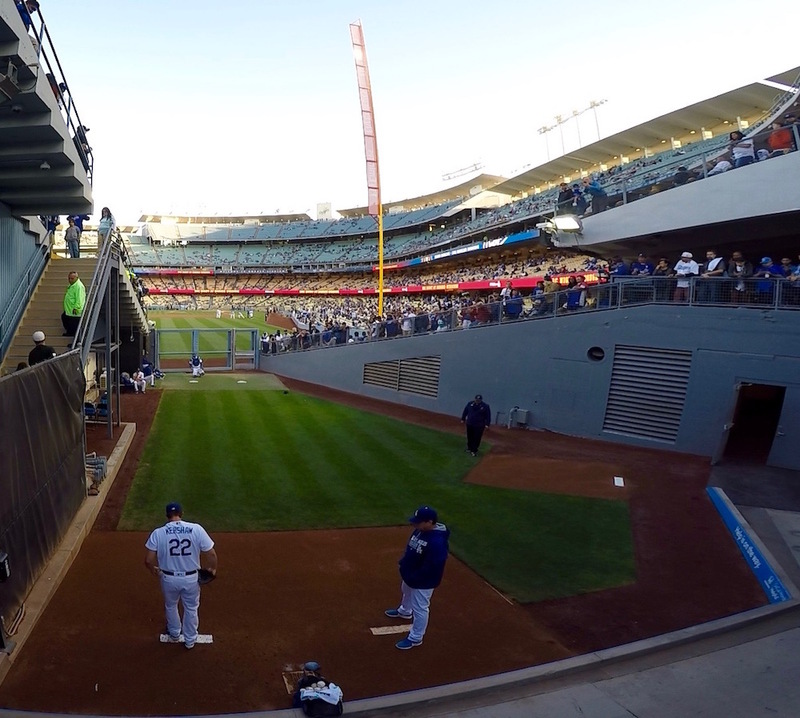 Grandal’s hand-eye coordination game is strong. 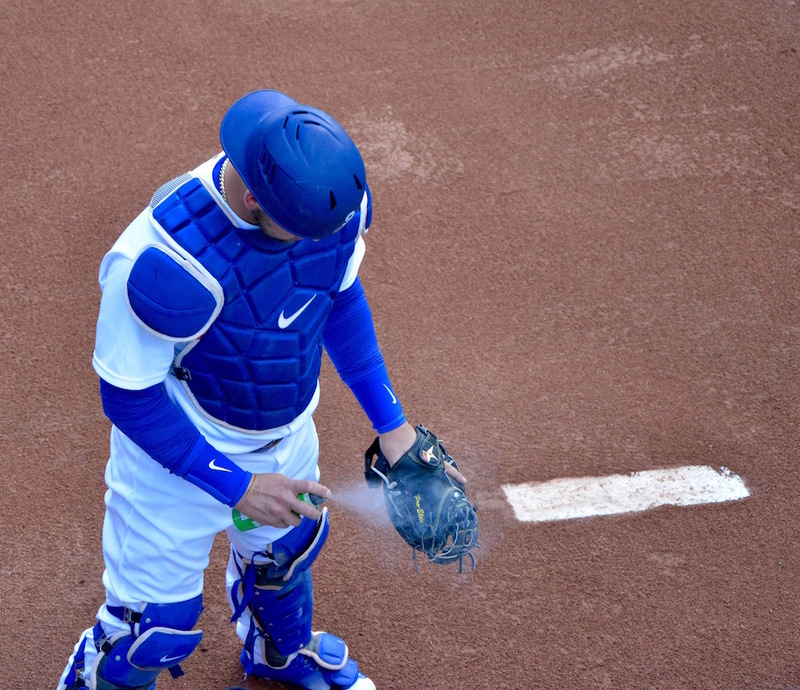 Grandal gives his glove a quick spritz of who-knows-what. 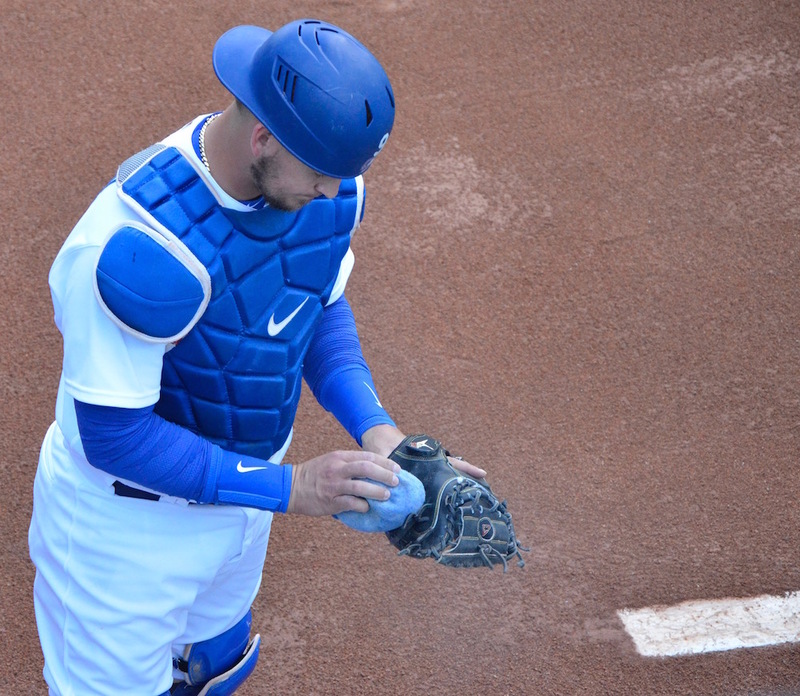 Grandal follows the spritz by dusting his glove with a rosin bag. Before you can frame a pitch, you gotta be able to hold onto the ball. 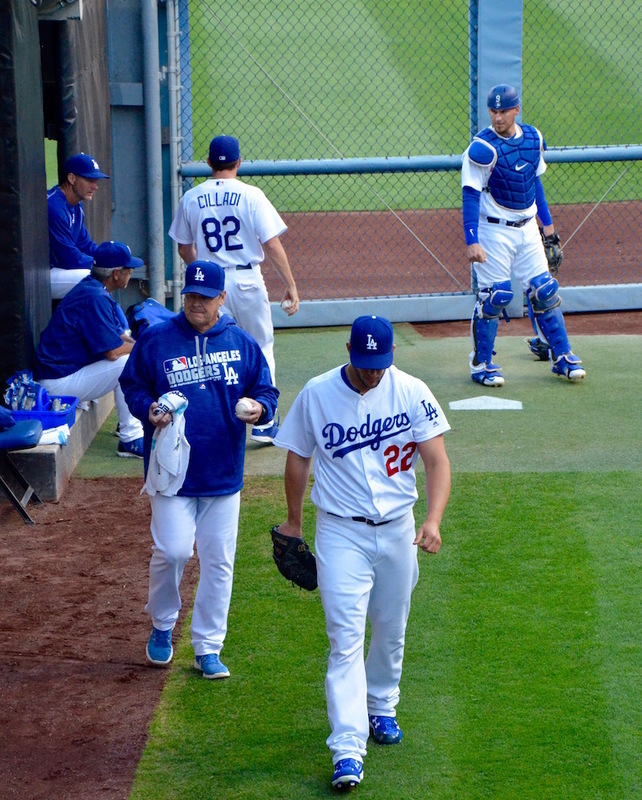 Kershaw arrives in the bullpen and is all business. 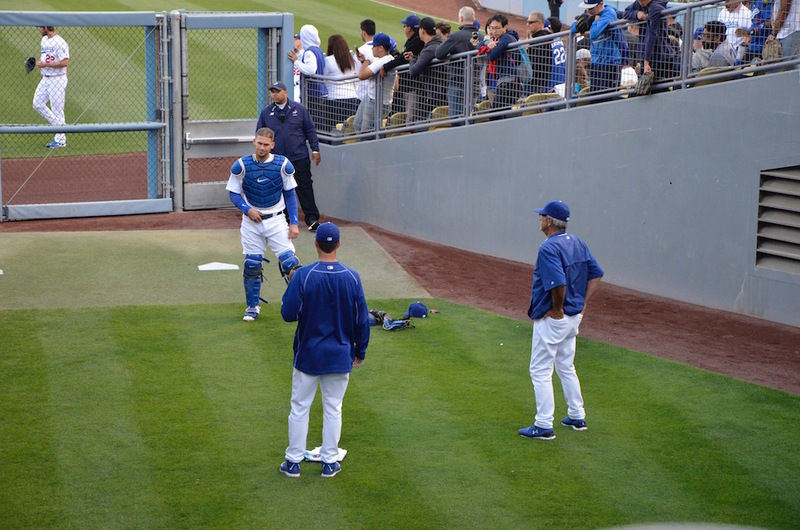 Dodgers pitching coach Rick Honeycutt follows Kershaw to the mound. 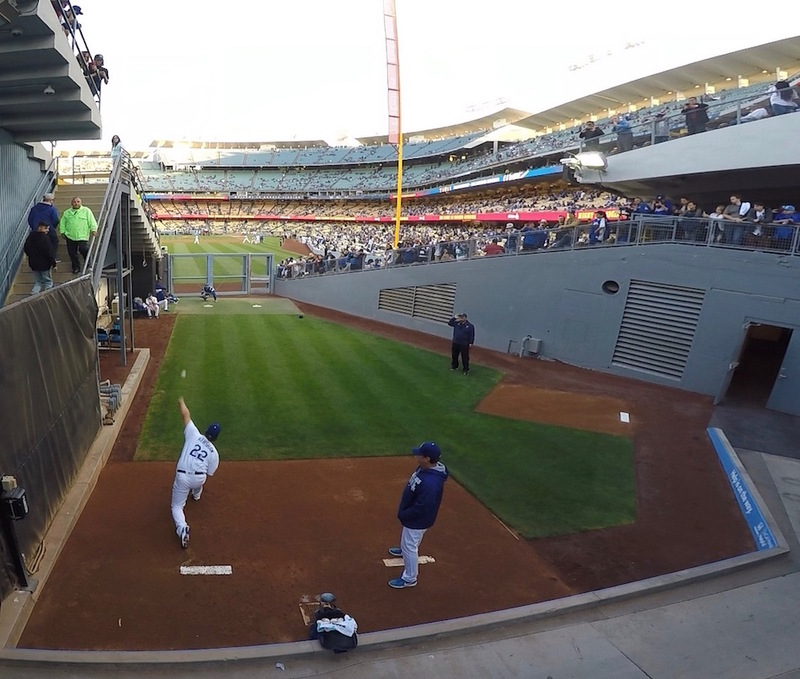 Kershaw begins to throw some heat. 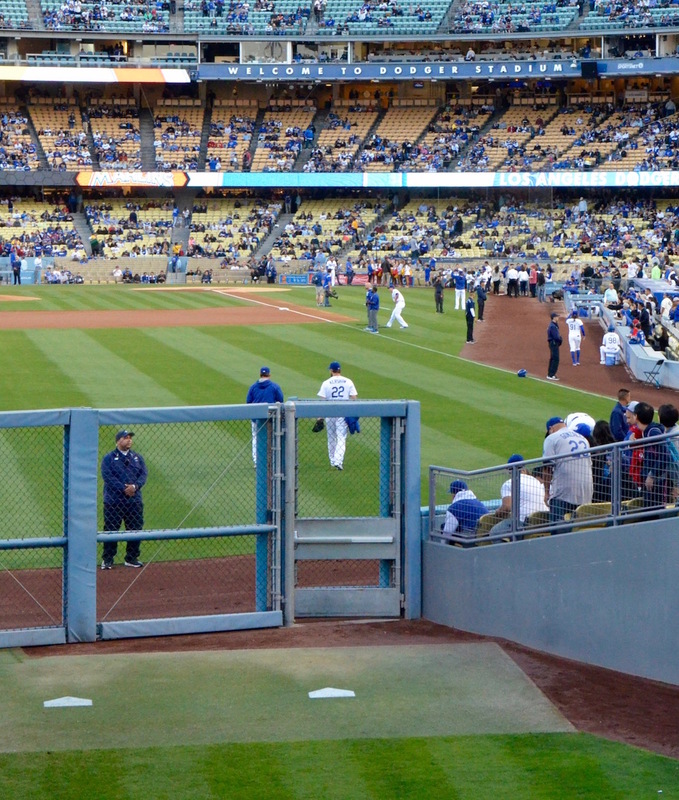 Look how far Kershaw strides from the rubber. 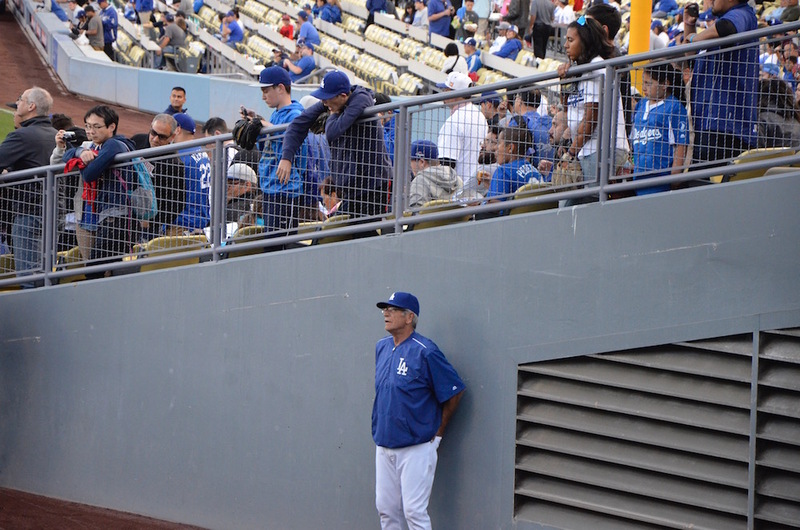 Catching instructor Steve Yeager, who’s normally a little salty on game day, noticed a tribute to Tommy Lasorda on DodgerVision and immediately became transfixed. It was a nice moment to see and one can only imagine the memories that were going through his head. 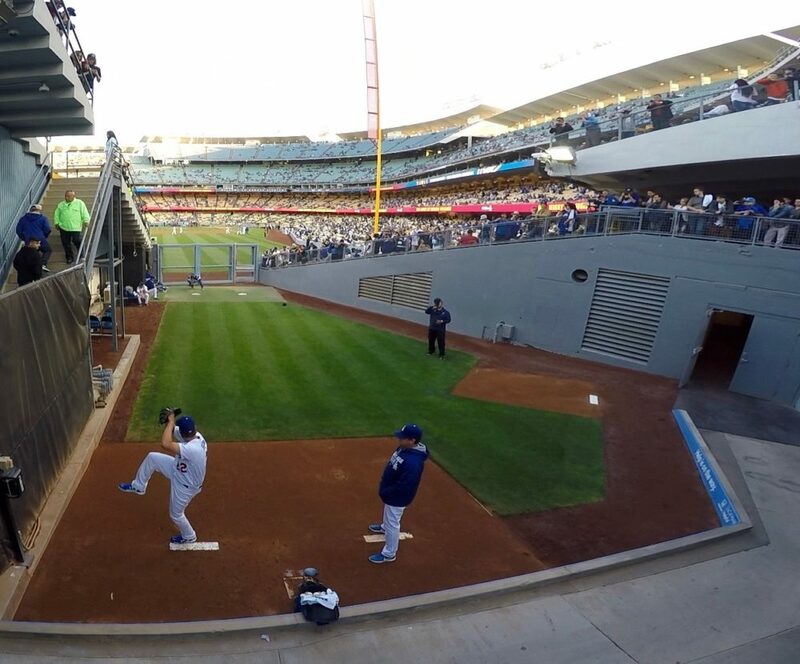 Time for Kershaw to go to work.